Since Caitlin just covered some possible fabric choices for the Rooibos today, I thought I’d chime in with the fabric I’ll be using as we go through the sewalong! 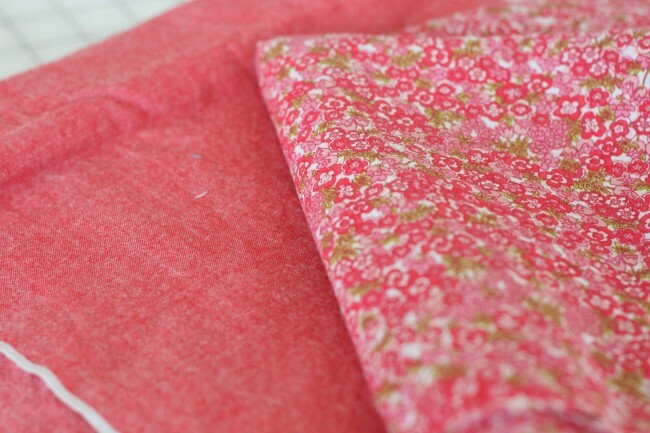 My main fabric is a strawberry-colored chambray. I just love the color, and I think the chambray will be a nice, casual choice. For the contrast, I chose the very small scale floral cotton shirting above. I plan to make some matching piping too. On Monday, we’re going to be making our muslins, and on Tuesday I’ll be covering some possible pattern alterations for fitting. I know, I love it too! It’s sort of red, but with the chambray weave, it looks pink/red. And I love pink. Such a good color! I cannot decide what fabric I want to choose, but I decided the perfect material is not in my rather large stock of fabrics so I get to get lost in the fabric store this weekend! wow, I love that chambray! Can you share where you got it? I bought it at a local shop here called Mill End. They have a great selection. 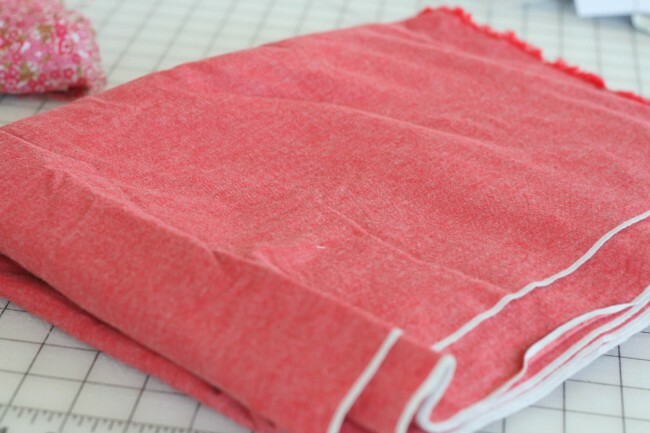 It’s not the same, but I saw that Denver Fabrics has a fuschia chambray that’s very inexpensive! so pretty! and i love the floral contrast you chose! i’m off to the fabric store this weekend to find a suitable plaid for my contrast :) so excited! Lovely combination, very soft and pretty. I’m hoping to buy my fabric this week and am open to ideas – I was thinking about something more appropriate for Autumn but I’m tempted to do something summery first. I was wondering if you would be making a muslin, so thanks for clearing that up. Looking forward to getting started! oh! i just love that fabric. i can even imagine it SMELLING just like strawberries. sooo pretty! Sarai your fabric choice is gorgeous! I have a quick question re: this pattern. I’m waiting for my pattern to come in the mail to participate in the sew-along, and I was reading Caitlin’s post about using a light wool, but to consider lining it. Does the contrast fabric piece of the pattern lend itself during construction to becoming a full bodice lining? If yes, this might help dictate what to choose as a contrast fabric to wool. I had been thinking of a creamy silk as a contrast to a black or charcoal gabardine, but as a full bodice and skirt lining, creamy silk could get expensive. I might opt for something a bit cheaper if it could be a full bodice lining. I think it would be pretty easy to convert the facing to a full bodice lining, since it’s an all-in-one facing. I don’t see why that would be a problem at all. Hi Jaq! First, I think a subtle stripe like a pinstripe could work, but there are a lot of seams, plus the curved seam of the midriff, so stripe matching would be near impossible. If I were doing stripes, I might make it fun by cutting the midriff piece on the crossgrain, so the stripes there run across the body. As for the name, I just name the pattern after things that are edible / drinkable! That whole collection was named after various types of tea (ceylon, oolong, sencha, rooibos, lady grey). I love tea! I ‘smiled’ out loud when I saw your fabric choice. I made a version of Macaroon in the same floral print (top) with a similar shade of tomato soup linen/cotton for the bottom. One of my favorite summer dresses this year! Can’t wait to see how the combination comes out in this pattern!